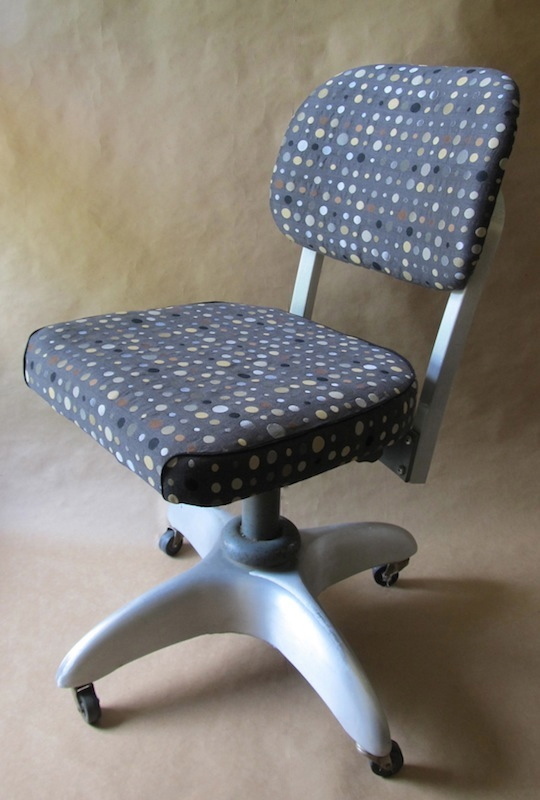 These Goodform chairs are good candidates for re-upholstery. They’re nearly indestructible and the heavy aluminum bases and frames beg for something more interesting than the institutional vinyl that’s original to them. Best part? 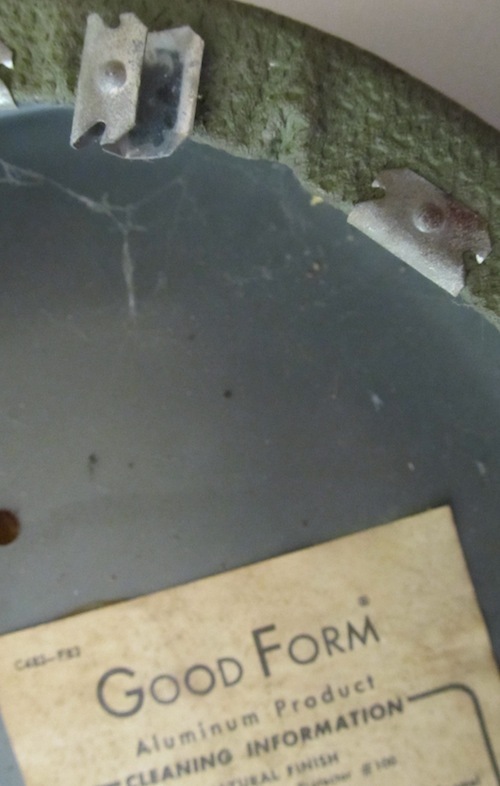 There are little clips like these holding the vinyl in place on the steel parts. No staples or tacks to remove! Some have metal tabs—only slightly more complicated. The back on this one is two pieces: the inside back, which curves to the outside, and the outside back, which serves to cover up the fabric edges on the inside back. The original glue on these was still tacky after 50+ years. The finished chair with Unika Vaev‘s “Wink” fabric in the slate colorway. This is a very durable fabric that’s mostly nylon and wool so it has a nice feel in spite of being tough. I think the silvery dots go really well with the aluminum chair frame. This entry was posted in mid-century modern office furniture and tagged goodform, reupholstery, steno chair, Unika Vaev Wink. Bookmark the permalink. Hi. 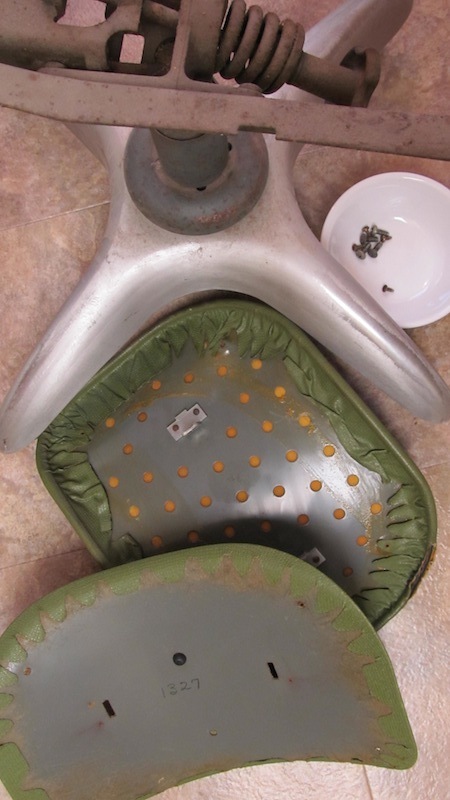 I came across your blog searching for Goodform chair repair. Great site! I have this same chair that’s in pretty good condition except that one of the wheels came loose and the ball bearings fell out. We picked up the ball bearings but are having trouble tightening the wheel back up. It has a odd looking screw. Would you happen to know if there is a specific tool needed for Goodform repair? Thanks so much! I’ve got a Goodform chair with wheel problems, too! I’d love to replace the castors. Do you know the best way to remove and replace those? I don’t know if Ellen will see your question, but I can tell you that a lot of castors on office chairs can be pulled out with a firm yank. I’m not sure if your Goodform chair has this type but it’s worth a try. Replacement castors are made with several different kinds of posts. You may be able to get ones that match yours exactly. Good luck. Sorry, I really don’t know a whole lot about the hardware on these chairs! If you still have the screw, try taking it to an Ace Hardware store. Most of them have about the best selection of screws and fasteners outside of a few specialty stores. You might also be able to just replace the ball bearing race (that’s the part consisting of the two plates with ball bearings in between). Good luck! Help! 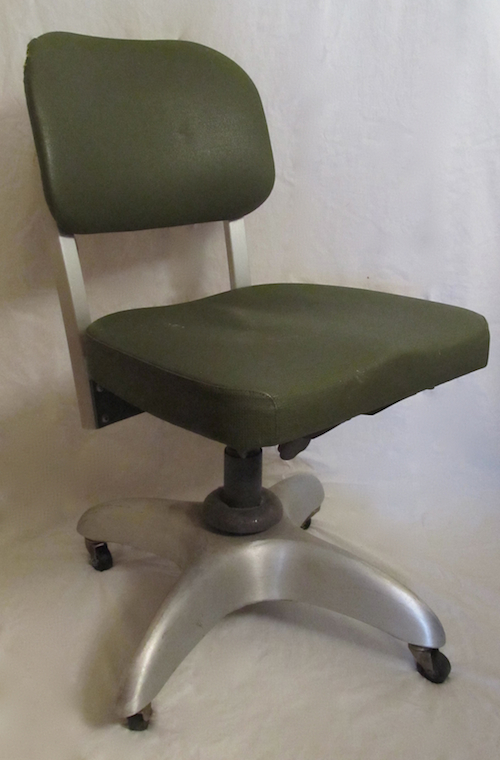 I have a 1957 Goodform tanker chair. Under the seat is a rubber wheel mechanism. The rubber is deteriorating and needs to be replaced. How do I get a replacement? Sorry, I don’t know where to get this part or if it’s even possible to find a replacement. My chair had the same problem, I think, and I eventually gave up trying to find a fix.